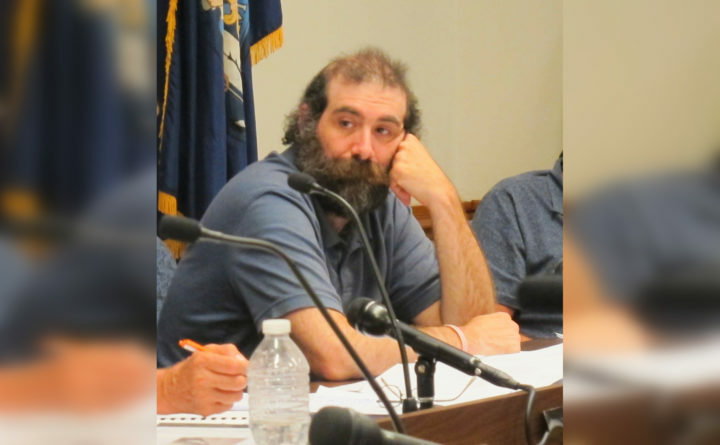 Bar Harbor Town Councilor Matthew Hochman sits at a July 2018 council meeting in this file photo. A cafe owned by Hochman and his wife has been served with an eviction notice over late rental payments for space it leases from the Criterion Theater, but Hochman says he plans to run for re-election this summer despite his personal financial situation. A cafe co-owned by a Bar Harbor town councilor has been served with an eviction notice by a local nonprofit, but the councilor says he still plans to run for re-election this June. Matthew Hochman and his wife, Angel Hochman, have owned Trailhead Cafe since 2012 and, at times, have had difficulty paying the cafe’s rent. The restaurant is located next to the entrance of the Criterion Theatre on Cottage Street and leases its space from the theater. Hochman, who serves as vice chairman of the local town council, said Tuesday that the cafe is now up to date on its rent with the theater, though it has struggled to make payments on time. He said that the theater last Friday gave the business 30 days to move out but that he is hoping to reach an agreement with the theater that will allow the business to stay. The cafe is open in the meantime, he said. Attempts to contact theater officials were unsuccessful. One alternative is relocating the cafe, but move-in ready restaurant space in Bar Harbor is scarce, and renovations can be prohibitively expensive. Hochman noted that the Morning Glory Bakery, another longtime local business, also is looking for new space after it was unable to renew its lease on Rodick Street. “Finding a new location is incredibly difficult,” he said. Still, he and his wife hope one way or another the cafe will be open for business somewhere in downtown Bar Harbor this summer. Hochman said that it can be difficult for year-round shops or restaurants in Bar Harbor to stay open throughout the winter, which he described as being “hyper tourism oriented,” but that he and his wife have purposely kept the cafe open year-round. Bar Harbor swells with tourists each summer and fall, but the majority of its hotels, shops and restaurants close for the winter. The Hochmans used to also own the now-defunct Opera House Cafe a few doors down on Cottage Street, which was built for seasonal use only and has since been demolished. They were always disappointed it could not be open year-round, he said. His parents used to own and operate Ryan’s Pizza, located where Little’s A’s is now at the west end of Cottage Street, and made a point of keeping that business open throughout each winter. Hochman said there has been an uptick in the past few years of local restaurants that stay open in the winter, the downside of which has been that there’s more competition for a relatively small set of customers. Rents are high in Bar Harbor, he added, and many retail businesses have to earn most of their annual income in just a few summer months to make ends meet. As for his role on the council, Hochman said he plans to run for re-election this June, when his term ends, despite his current personal financial challenges. He would have to manage his time at work and his civic duties differently if he worked for someone else, he said, but it could be done. One of the reasons he first ran for the town council three years ago, he said, was to try to help improve another issue in town: the shortage of year-round affordable housing. That issue has been overshadowed in the past year by other pressing topics such as limiting cruise ship traffic and redeveloping the ferry terminal on Route 3. He said he would like to serve another three years to have time to help make the town more livable for small business owners and local residents.